A cross with Tangie, Dankman’s Sunny D has deep orange flavors that produce a sweet yet pungent scent. Buds are dark green, medium in size, and blanketed in orange pistils. 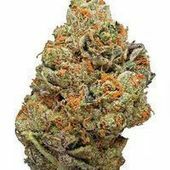 Like a fresh glass of orange juice, this hybrid may be great for starting your day and getting your mind and body moving. "Got a gram free from my dispensary here in Chicago and figured I would give it a review. Smoked a bong of it yesterday and just finished the rest of it in a joint. This stuff is pretty high in Cannabinoids, clocking in at around 30% I need to note my tolerance is pretty high, I tend to lean towards concentrates but have been trying to stick and incorporate more flower in my routine which has been going well. Anyway..."
"This Sativa by Passiflora contained 17% THC. Effects made me happy, uplifted, energized, & relaxed like many Sativa's do. Buds were forest green with light tan pistils & fine trichomes. My favorite part of the strain was the scent & flavor. Tart, pungent, citrus, tangerine, & orange flavors was very appealing to my senses! Protect The Harvest!!"